Stacy Hansmeyer was a Forward for the UConn Huskies from 1996 – 2000. While at UConn she was a player on the 2000 National Collegiate Athletic Association Championship Team, appeared in the NCAA Elite Eight twice, and the Sweet 16 once. She was also a part of four Big East regular season and tournament titles. I had the pleasure of talking to Stacy in June 2006 about her career so far, and reflect on her basketball experiences and memories. When Stacy reached high school as a freshman she was put on the varsity team. “We ended up winning the State Championship that year, in 1993, and then went on to win another championship my senior year. Both of them were with Coach Cole as our head coach at Norman High School.” In Stacy’s senior year the team was much better than any other team in the state of Oklahoma. They had several Division I players on the team, and won the state championship game by 40 points. There were many memorable games, and moments while at UConn, and one game she enjoyed recalling was in her senior year playing Tennessee in the National Championship game, winning by about 20 points. It was similar to her high school championship game, wining by about 40 points. Stacy earned her Bachelors Degree in Communications. 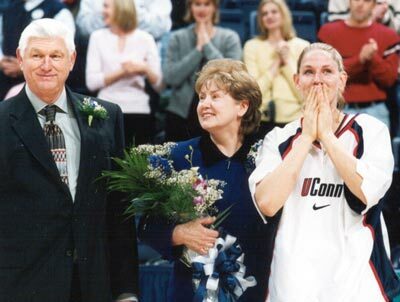 Knowing that at some point in her life she wanted to be a coach, she stayed at UConn a fifth year as a student assistant coach gaining coaching experience. 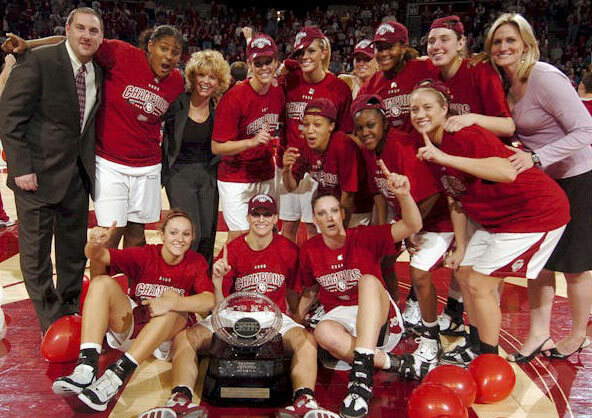 Stacy will soon begin her sixth year as an assistant coach at the University of Oklahoma where she has come full circle, and is working for her first coach, Sherri Coale. So far Stacy’s job has been fantastic, everything she thought it would be. Her best memory and story so far was during her first season at Oklahoma making it to the NCAA Championship game where they met, and lost to UConn. This past season Oklahoma went from being a good team to an elite team winning 19 games in a row, and reaching the NCAA Sweet 16. Stacy’s looking forward to the coming year with twin returnees Courtney and Ashley Paris, and new recruit Amanda Thompson ranked number 7 in the country; Stacy played a big part in recruiting her. The recruiting class coming in is viewed as in the top five in the country also including former NBA star Hakeem Olajuwon’s daughter, Abi. A routine day during basketball season is very busy for Stacy. She has to do all her office work responsibilities in the morning, practice goes from around 1:00 – 3:00 followed by scouting or recruiting or watching film before leaving work for the day. Stacy comes from a family of five kids, one brother, and three sisters who are all singers. Stacy sang the national anthem while at UConn once, and also sang at Oklahoma once.